Let’s pick up where we left off. In our discussion of eczema and psoriasis, we described the common theme of underlying inflammation manifesting in rashes of different appearances. The theme continues today, with the difference being overlying inflammation. Contact dermatitis (dermatitis = skin inflammation) results from some external entity becoming a nuisance to your skin and generating a response in the form of a rash. 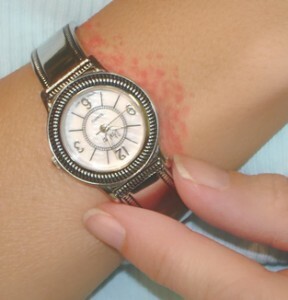 You know this in many different forms (shown in the pictures below) – think about those old nickel coated watches, piercings gone bad (piercings also cause actual infections, which is a different consideration), clothing (below is a picture of contact dermatitis caused by flip-flop slippers), poison ivy and diaper rash. I bet the lead picture, which seems like a brand of a butterfly necklace pendant, as well as the following pictures look familiar to many of you. 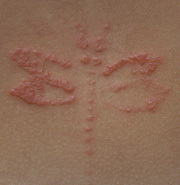 These rashes are examples of allergic contact dermatitis. Your immune system is generating a response because it believes it is under attack by whatever has touched you. The way the body defends itself leads to release of various chemicals (most notably histamines) that cause the rash. 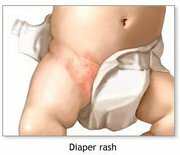 The reason I picked the illustration of the diaper rash is to remind you that the rash actually is in the distribution of the diaper (not just under it), meaning that it may be the diaper that’s the culprit. In other words, don’t just zone in on feces and urine as the problem. Allergic contact dermatitis can occur from – well, anything you’re allergic to, but it’s commonly associated with latex, fruit peels (especially citrus), lotions, perfumes and other topical substances applied to the skin. When we discussed eczema earlier, we were describing irritant contact dermatitis, which occurs because something damages the skin (remember eczema is called “the itch that rashes”). Imagine that you’ve sensitized and damaged your eczematous skin by scratching away at it and then place something irritating on it. That’s what this is. The longer the new irritant stays on the already damaged skin, the worse the inflammation is, and the more violent the rash appears. So let’s get to the bottom line: the name of the game is avoidance (as in poison ivy, latex or other known irritants), prompt recognition and removal of irritants, and symptomatic treatment. If you come in contact with a substance that burns or rashes immediately, remove the object or get away from it, and then wash the affected area with mild soap and moderate water. Consider oral histamines (e.g. benadryl) and a mild OTC hydrocortisone ointment. If the rash isn’t better within a few days, or if you ever feel short of breath or as if your throat is closing, contact your physician or the local emergency room immediately for evaluation. Unless you have an underlying condition like eczema or psoriasis, contact dermatitis should resolve within 2-4 weeks with this approach to management. So in closing, remember: it’s not just the more you itch, the more you scratch. It’s also the more you scratch, the more you itch. Break the cycle.